As of October 1, 2018, our newest clinic opened its doors and started serving patients in Southwest Calgary. You can find us in the southeast corner of Mahogany Village Market, in the two-storey building behind the Sobeys. Our clinic is located on the second floor, and the entrance to come upstairs is behind the building (on the east side), facing the parking lot. Watch our latest video introducing the staff at Mahogany Village. The clinic will be closed for Good Friday on Friday, April 19. We are located in the southeast corner of Mahogany Village Market, in the two-storey building behind the Sobeys. Our clinic is located on the second floor, and the entrance is located on the east side of the building, facing the parking lot. There is free parking available in the surface lot on the east side of the building, where the access to the second floor is located. Street parking is available on the west side of the building; however, to access the clinic you’ll need to walk around the building to the entrance which faces the parking lot. 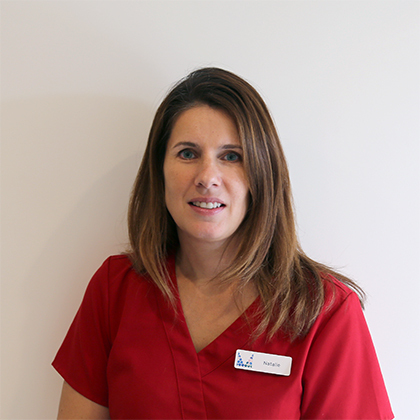 Natalie has been with Mayfair since 2005. She received her MRT training in Kingston, Ontario, at the Eastern Ontario School of X-ray Technology and spent a number of years as the liaison for the SAIT MRT program, working closely with students. 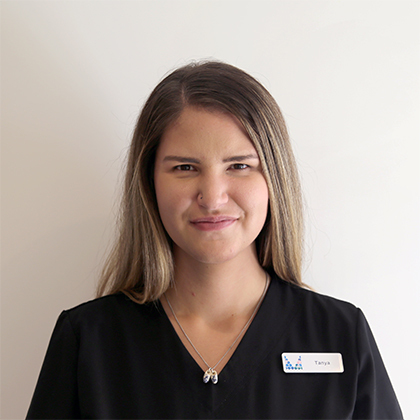 Tanya has been with Mayfair since 2013, working as a receptionist and then as a pain therapy booking coordinator. She has completed Office Assistant/Unit Clerk and Administrative Professional certificates.